Spectacular, but simple tricks with coins that can be performed by any one, young or old. COIN MAGIC is fun! These tricks are as astounding as larger illustrations and can be performed anywhere. All equipment for a ten or fifteen-minute exhibition will fit nicely in a vest pocket. 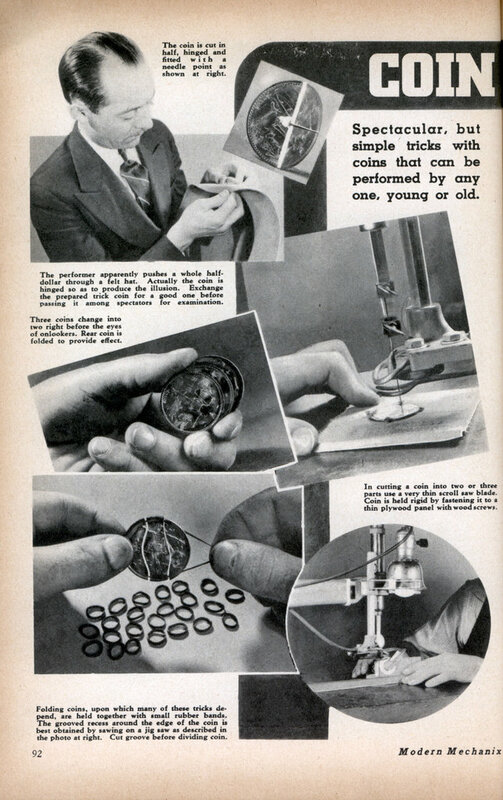 As it is unlawful to mutilate U. S. coins, use imitation half dollars such as sold by toy stores. Practice each trick in front of a mirror before performing it in public. The illustrations show how to pass a half dollar through the neck of a narrow-mouth bottle, through a finger ring, and half way through the brim of a hat. Also the method of vanishing three coins in one hand, changing a nickel into a half dollar, causing coins to become magnetized and as a spectacular climax, producing coins out of thin air.